Irgendwie entscheiden sich gerade recht viele Menschen in meinem Umfeld dafür, krank zu werden, sich in irgendwelche dummen Unfälle zu verstricken oder aus anderen Gründen körperlich nicht gerade in Bestform zu sein. Auf jeden Fall brauche ich derzeit viel zu viele Genesungskärtchen. Hier seht ihr die letzte, die ich gemacht habe. Somehow quite a lot of people I know decide to fall sick, get involved in some odd accidents or are for other reasons not feeling particularly well. In any case I unfortunately do have to send out much too much get well cards presently. This is the last one I created. Verwendet habe ich dafür eines der süßen Motive aus dem herzallerliebsten "Get Well Gang"-Set von WPlus9. Die etwas angeschlagene kleine Katze habe ich mit Museum-Aquarelle-Stiften von Caran d'Ache koloriert. Die rosa Wolken im Hintergrund sind mit Distress Ink gewischt. Der Spruch stammt ebenfalls aus dem "Get Well Gang"-Set von WPlus9. For my focal image I used one of the cute critters from WPlus9's adorable "Get Well Gang". I colored the sick little kitty with Museum Aquarelle watercolor pencils by Caran d'Ache. The pink clouds in the back are sponged with Distress Ink. The greeting's also taken from WPlus9's "Get Well Gang" set. 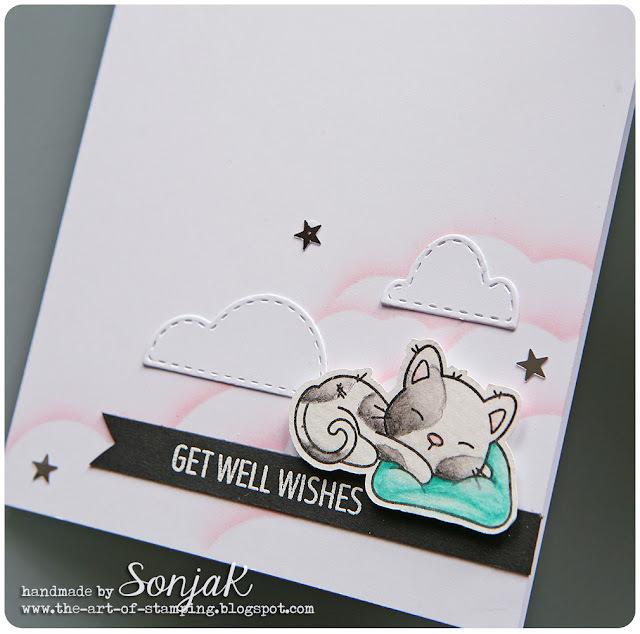 Stempel | stamps: WPlus9 "Get Well Gang"
Farben | colors: Caran d'Ache "Museum Aquarelle", Distress Ink "Spun Sugar"
Stanzen | dies: WPlus9 "Sunshine Layers", Lawn Fawn "Puffy Cloud Border"
This is adorable. I love the creative background you created, too. It looks like your kitty is floating on cloud 9. What a sweet way to wish someone to get well. Thanks so much for playing along at CASology this week. So cute! I love the soft look of the watercoloring on the little kitty. They way you clustered all the design elements in the lower right corner is perfect for CAS design! Perfectly coloured and beautifully CAS Sonja! Thank you for sharing with us at CASology this week!